We’ve all been lectured on the importance of serving our families home-cooked meals. But that can be hard to do when you leave the home before 8 a.m. and return after 5 p.m. For those really hectic days, the slow cooker is your new best friend. Instead of rapidly boiling or roasting foods, a slow cooker or Crock-Pot maintains a low temperature for a longer period of time. This means that you can put dinner together in the morning and leave it to cook throughout the day. Modern slow cookers have a variety of settings to suit whatever time constraints you’re working with. And when you finally return home, it’s just a matter of scooping your creation onto plates and calling the troops to the table. Dinner in minutes! 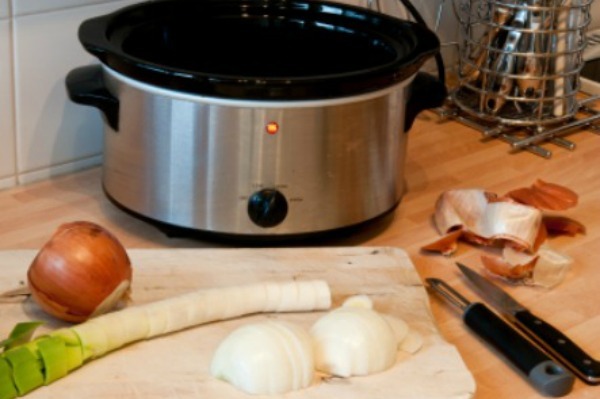 Slow cookers are probably best known for their soups and stews. You can really toss just about any meat and veggies in with some spices and broth to create a one-of-a-kind dish. Any vegetables that are about to expire or meats that have been sitting in the freezer for too long can easily be incorporated into a Crock-Pot stew. The moisture and long cooking time produce tender meats and flavourful veggies. But if you prefer a little guidance when it comes to your Crock-Pot cooking, start off with a delicious chili that you and your family are sure to love. If you’re a good old-fashioned meat-and-potatoes kind of cook, it can be exhausting when you get home to prepare not just the protein portion but the sides as well. Getting your meat, potatoes and a couple of veggies can wind up being far more time-consuming than you think. Make things easier on yourself with a slow-cooker roast. Simply load everything into the pot the morning of (or the night before, and store it in the fridge) and then set it to cook while you’re out for the day. For a sweet and succulent dish, try a curry pork roast with cherry orange sauce. If you’re in the mood for a little more spice to your dinner, the slow cooker is perfect for many international dishes, such as risotto or Spanish rice. The Crock-Pot allows all the ingredients to slowly cook together so the flavours intermingle beautifully. For a good start, whip up a pot of jambalaya. Simply take care of the preparatory steps in advance and keep the ingredients in the fridge until you’re ready to bring them together in the slow cooker. Slow cookers are also great when you’re cooking a variety of dishes for party guests and you simply don’t have enough oven racks and stove elements to go around. In such a case, your slow cooker can really come in handy. Consider getting the appetizer portion of the meal done in your slow cooker with a French onion soup. You can fix it up early in the day and forget about it while you work on your entree and hors d’oeuvres. And slow cookers aren’t just for dinner. Have you been meaning to cook your family a nice homemade dessert, but just never seem to get around to it? Well, a blackberry cobbler might be the way to get things back on track. No matter what you decide to use your slow cooker for, once you get the hang of it, you are sure to have a far easier time getting food on the table, even on the busiest of days.